92 points - Last tasted on September 18, 2004 - Tasting notes here. In our opinion:Bablair used to be a hidden gem until quite recently, but a few old whiskies of exceptional quality such as some 1966’s managed to catch many whisky lovers’ attention, especially since these bottling were very friendly priced. 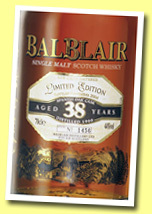 Many discovered that Balblair can display a wonderful fruitiness, very pure, with sometimes something discreetly Irish. 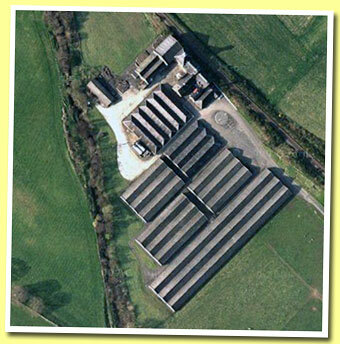 Add to that a wonderful little distillery where no ugly visitor centre was built (please, don’t!) and some extremely knowledgeable and friendly managers and assistant managers plus some excellent new versions in catchy bulky bottles and you’ll understand why Balblair’s star should shine even more brightly in the future. A little distillery with a beautiful soul. – December 20, 2007. Balblair was founded in 1790 by one John Ross, but the oldest buildings at today's distillery date from the 1870's. Ownership of Balblair was in the hands of Andrew Ross & Son by the end of the 19th century and had been transferred to Alex Cowan & Co in 1896. The Balblair distillery was closed during World War I in 1915 and it wasn't revived again until 1947, after the end of the second... More on Malt Madness.